I found the baking bonanza today! Even better, at one of those yard sales where pricing is done by dimes and quarters! I brought home a new Bundt mini shaped loaf pan for $3 (and only paid that much because it is a perfect Christmas gift for my grandma-in-law). The Springform and square baking pans were ten cents each. And to think, I almost paid $1.25 for two foil pans last week! 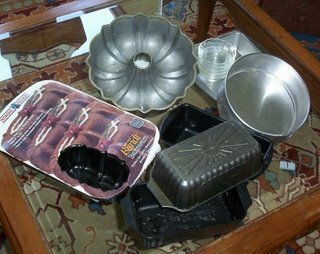 Also pictured are three Nordicware loaf pans for a quarter apiece and the original heavy Bundt pan for 50 cents. I suspect part of my poundcake's dryness stemmed from the thin pan in which it baked--the typical thick crust never formed as it did in my long-lost Bundt. Wow! Those are some awesome deals! Way to go! Already this spring, I have picked up a lot of baking pans-a tube pan, a brand-new springform pan, several bread pans, several different sized round cake pans- most for a quarter or 2. BTW, could you give directions for making yogurt? I think you mentioned a while ago that you made your own. I had the same good fortune this past weekend, Meredith. I found some WONDERFUL, beautiful, vintage glass dishes and serving pieces, all marked 25 cents to 50 cents! I also got a lot of baby clothes in the same price range. And as I was paying for my purchases, I kept thinking about your blog headline that talks about God's provision through garage sales! Isn't it fun to find such wonderful provisions for our families, given to us by God? You did great! The springform pan alone was worth the trip. Now you have to make a cheesecake, LOL! I sure hope our garage sales start up in full swing this weekend. I'm aching to get out and bargain hunt! FRUGAL WEDDING GIFTS. The invitations from clients' children are rolling in about now : ) My husband is in a profession that people ASSUME rakes in tons of cash. The reality of running your own business is VERY different, though. I strive for frugality at home in our life, thrift stores, etc. It is all about other's perceptions, I know, but he likes to give cash. You can't give $5-$10 bills...the norm is $50 around here. Yard Sale scoops like the packaged mini-pans you pictured aren't deemed enough, either. Btw, Meredith, the photo of you and your little guy is precious. And some serious thinkin' goin' on in those eyes, too!